Susie moved to Asheville in 2005 and immediately fell in love with the vibrant music and food scene- not to mention those incredible mountain views! After graduating from UNCA, she found herself wondering what was next? With an entrepreneurial spirit (and lots of help and luck), she decided to take her passion for baking and newly found love of making ice cream to the streets of Asheville! With a hand made solar-powered cart built by her partner, Luke, the pair began selling their unique ice cream sandwiches to the people of Asheville! In 2017, Luke and Susie opened their first storefront in downtown Asheville. Focusing on all natural and creative twists on childhood favorites, the bake shop and creamery offers house made takes on pop tarts, donut holes, zebra cakes, oatmeal cream pies, and of course, ice cream sammies! With more space for production, they also began to sell their ice cream sandwiches to grocery stores and local markets throughout the Southeast. 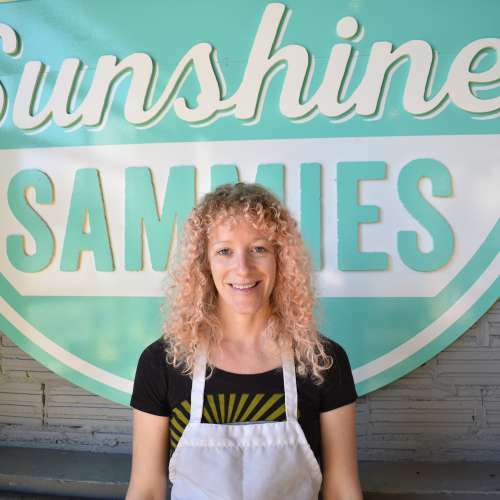 Susie has a passion for re-creating sweet childhood memories through her nostalgic treats and loves being a part of Asheville's exciting maker's culture.